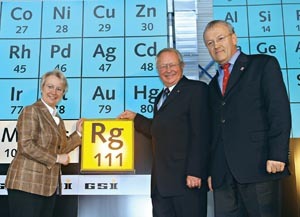 On 17 November 2006, a ceremony was held at the Gesellschaft für Schwerionenforschung (GSI) in Darmstadt, Germany, to celebrate the naming of element 111. The name of the element, which was discovered at GSI, honors Wilhelm Conrad Röntgen, the discoverer of the Röntgen rays (X-rays) for which he received the first Nobel Prize in Physics. Federal Minister for Education and Research Annette Schavan was “Godmother” at the ceremony. Element 111 was first detected in 1994 by an international research team led by Sigurd Hoffman. At that time three atoms of the new element were detected in experiments at the accelerator facility at GSI. Further experiments, both at the GSI and at RIKEN in Japan, produced more atoms of element 111, which confirmed the discovery. IUPAC officially recognized element 111 and requested that GSI, as discoverer of the new element, propose a name. The name roentgenium, with the symbol Rg, was accepted in 2004. At the ceremony, held almost exactly 111 years after the discovery of Röntgen rays, the new element was baptized. Roentgenium is currently the heaviest officially recognized element. It is 272 times heavier than hydrogen. At the naming celebration Minister Schavan said of the new element, “This scientific feat has dramatically demonstrated the position of the GSI as one of the foremost centers for fundamental physical research.” She completed the ceremony by placing roentgenium, symbolized by a die with the legend Rg, in the vacant place for element 111 in a large periodic table in the background. The guests were placed in the mood musically by the song “The Elements,” sung by Tom Lehrer to a tune by Sir Arthus Sullivan. In the song the names of the over 100 elements are sung in quick succession. At the same time an animated movie was shown, synchronized with the text of the song, that showed the periodic system being built. To produce element 111, the researchers made an atomic nucleus with 111 protons using the elements nickel and bismuth, which together have 111 protons. Using the GSI’s 120-meter long ion accelerator, electrically charged nickel atoms were accelerated to approximately 30 000 kilometers per second. The nickel ions were shot at a thin foil of bismuth. The high speed overcame the repulsion between the atomic nuclei of the two elements and they merged to give an atom of element 111. These occurred only rarely. On average, one atom of roentgenium was produced in a week. The total number of atoms of roentgenium produced to date by the GSI is six. Page last modified 16 April 2007.